As part of the worldwide phenomenon that is Free Art Friday, I’ve placed at least one piece of free art in Northern Virginia for anyone to find and keep nearly every Friday since August 2013. Think of it as street art that anyone can take home. Imagine it as a way of building and engaging community. I view this project as a way to disrupt the isolation of living in Suburbia by creating situations of chance and surprise, and instigating dialogue about ownership, creativity, commodity fetishism, community, and connectivity. The transitory, ephemeral, and unpredictable elements of my Free Art Friday experience have come to feel very much akin to aspects of performance art. Through these eight months or so, the process of creating art specifically designed for Free Art Friday, scouting out locations, leaving my art out in the world, taking photographs of my free art in a variety of locations, posting the photographs to social media, and engaging with the audience have evolved into an ongoing, elaborate, documented, and joy-filled performance. The audience is key. Finders, admirers, and even critics of this project have helped to form and influence its evolution in ways I had never imagined. I’ll be leaving another piece somewhere in the world today. You can view past Free Art Friday pieces and look for clues to find pieces yourself by following me on Facebook, Twitter, or Instagram. Happy Finding! I had a such fabulous time this weekend participating in the 3rd Annual Arlington Artist Alliance Art Studio Tour. 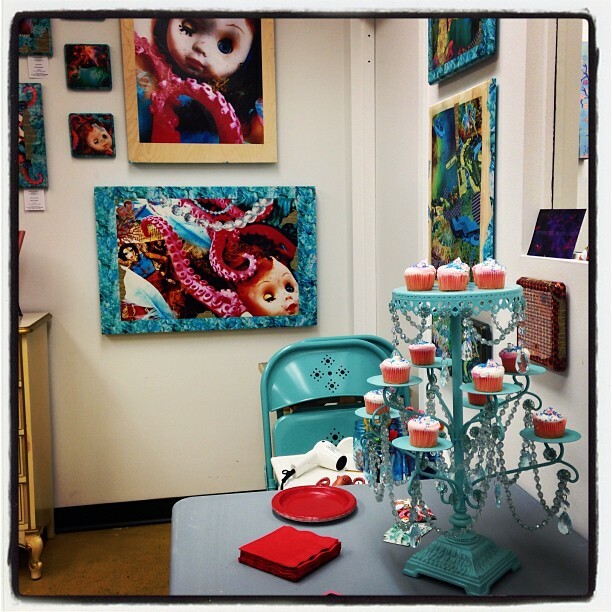 Working in the open studio provides an amazing variety of creative and collaborative opportunities. So many incredible artists and art lovers came to visit, and I am feeling very grateful for all the love and insights that they brought. I am beyond blessed and lucky to be surrounded by fantastically talented and dedicated artists. Thank you to all of you!!! Check out this exciting article here, all about the art studio tour, my artwork, and my studio space at Red Studios at Art Underground. And if you missed the studio tour, or would like to come visit again anytime, feel free to contact me via twitter, my contact page, or my Dear Suburbia page on Facebook to set up a studio visit. Plus, yes, upon request there may be cupcakes!!! I need music like I need air. Music is a lifeline…a message of hope from the world beyond….especially in suburbia. So I have to say that I’m thrilled to have found the most exhilarating, truly wonderful, perfection filled indie music blog called 70dayweekend, which introduced me to TV Girl and oh so much more. And yes, maybe I’m gushing, but music does that to me. Happy to be rejuvenated, and feeling gratitude today for the life-giving, soul-enriching, dancing-on-the-bed-inspiring power of music and music lovers everywhere. Enjoy. Dance. Love.